March has been a big month for fun new casino games in the online slots world, with various themes being issued throughout April, offering a variety of bonuses and features. Now you’re about to learn about two of the best ones you’ll find out there. 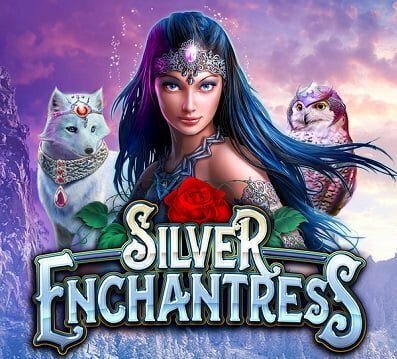 First off we have Silver Enchantress Slots which was just released last week by High 5 Games and people have been waiting for this one for months. Featuring 3D graphics, stunningly designed creatures, and a blue haired beauty in a sparkling headdress, it really is as the name suggests: mystical and enchanting. With 23 ways to win and a jackpot offering up to 300,000 credits, it also packs a huge win potential. The action is magical, offering the “Blinking Bucks” bonus that’s triggered by 6 or more successive wins followed by the “Racking Up Riches” tumbling reels feature. In addition you’ll find tons of Wilds popping up on all of the reels except for the first one, and if you hit three or more Scatters it’ll award you with a bonus round of 10 free spins. If all of this wasn’t enough, wins are followed by additional opportunities to increase their size, where unused symbols drop off and new ones appear, resulting in new combinations – this is just as crazy as it sounds! While Silver Enchantress reminds us that winter has only just passed, Deep Blue Sea Slots has us thinking forward to the sweet heat of July, with more of a summer feel. This 26 payline game from up and coming software developer Fugaso is set on the bed of the ocean, featuring cute and cartoonish characters, a snarky-looking shark for a Wild, coral reef and colorful tropical fish. You really have to see this one to appreciate the beautiful details. The bubbling waters made us long for the beach days but like us, you may be willing to settle with spinning a few reels on a title with “Walking Wilds”, free spins, Re-Spins, Re-Spin Wilds and various other bonus features. It offers a fat Return to Player of 96% so it has the win potential that most will enjoy, but it’s complemented by fascinating visuals and a banging soundtrack that will entertain you more than a boombox on a beach towel. Whether you are still shovelling snow or preparing your gardens for the season to come, these titles are sure to entertain you on the days that you’d prefer to just curl up with your computer. So swing yourself on over and check out the huge list of seasonal slots at Trada Casino that will have you giddy with Spring Fever.